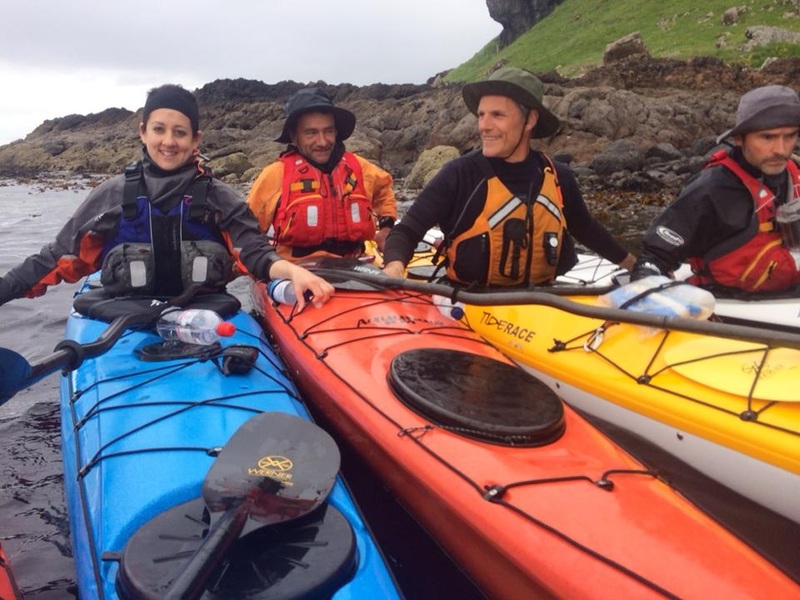 Five Chelsea Kayak Club paddlers made their way North from London, through beautiful Scottish scenery, to join Geoff and Sandra in Kilchoan. 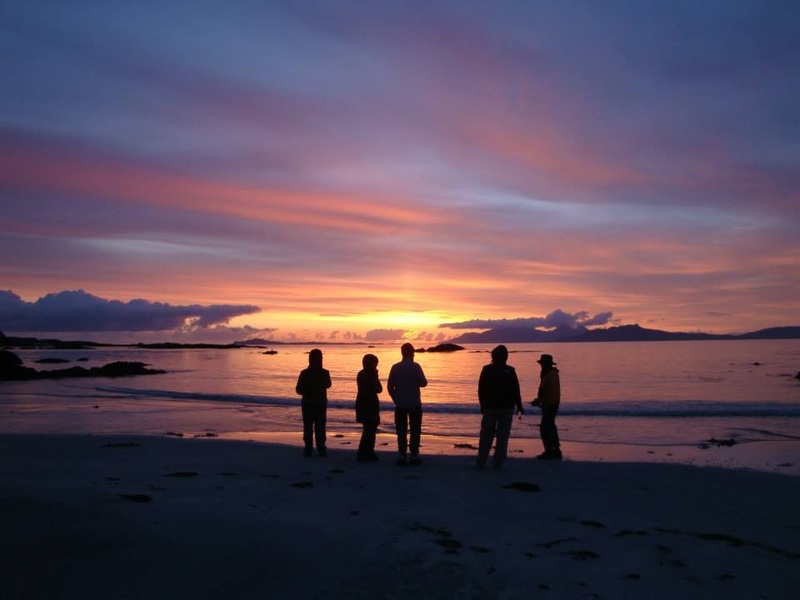 The Argyll scenery is stunning, and Kilchoan is in a particularly beautiful part, nestled on the South Coast of the Ardnamurchan peninsula, with views stretching out across the Sound of Mull. 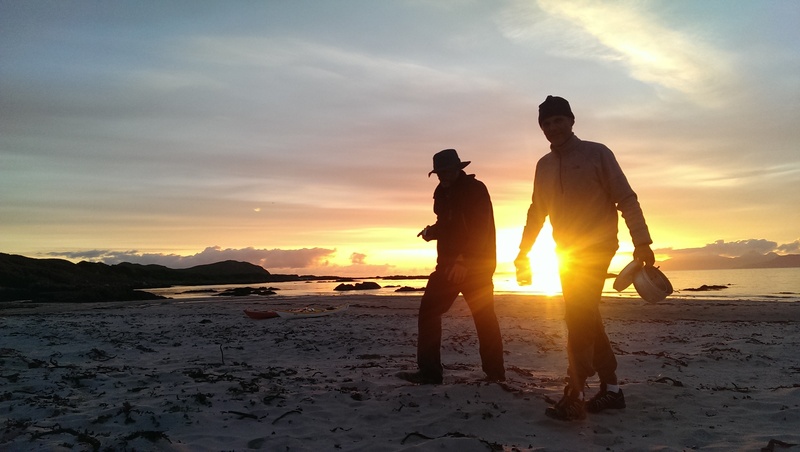 Alex, Philippe and Dan, who had left London at 0430 in the morning in order to be on the water for 1830, made it in time to paddle out into the Sound of Mull for some pre-dinner rockhopping. Kenneth and I raced through the countryside and made it in time to join everyone for a gourmet Saturday night dinner courtesy of Geoff and Sandra, including fresh local lobster and gorgeous pavolva. Conditions for the week ahead seemed favourable, with force 4-5 winds forecast for the first couple of days, dropping off after that with sun poking through at the end of the week. 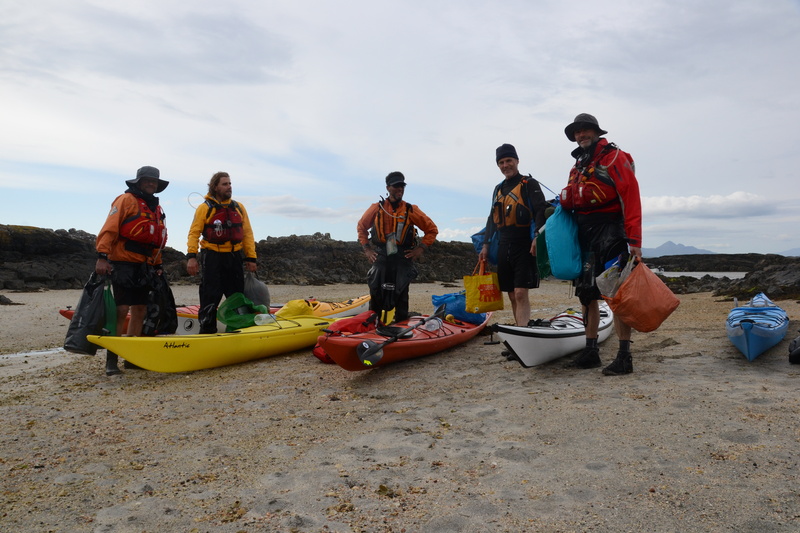 Geoff, Philippe, Dan, Alex, Kenneth and I collected at the jetty in Kilchoan on a slightly overcast Sunday morning for our first day’s paddling. 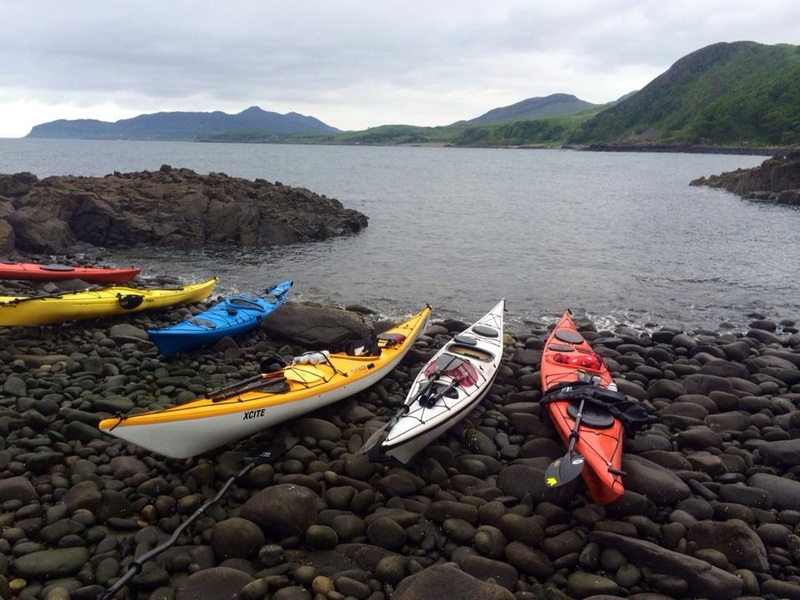 We launched at the jetty, and set out for a shortish paddle along the South Coast of Ardnamurchan, east from Kilchoan to McLean’s nose, stopping near Rubha Ruadh for lunch. Afterwards, the tide still out, the six of us wandered along the shingle beach, lined with hardy oak trees, and stopped to inspect the flotsam and jetsam. 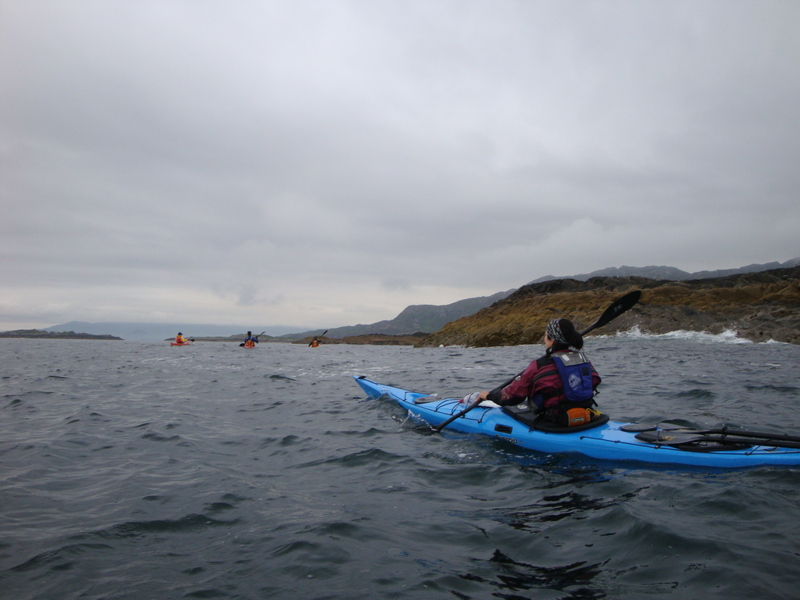 On the way back we kept up a brisk pace, despite our unaccustomed paddling muscles (some more than others! ), and arrived home in time for a chilled evening at the ranch. Alex carried out some boat maintenance. Over our first hard-earned dinner of mushroom risotto we planned the next day’s paddling. I got up a couple of hours early on Monday morning to fix my skeg, and was welcomed by grey skies and a light drizzle. And a few midges. As it turned out, 2 hours was just enough time – I had to try three fixes on the “kink-free” rope and bungee skeg system before it decided to spring into action – only after I’d realigned the elastic bungee on the cog that levers the skeg down, changed the cog orientation, and retied the knot to shorten the bungee, which had become overstretched. 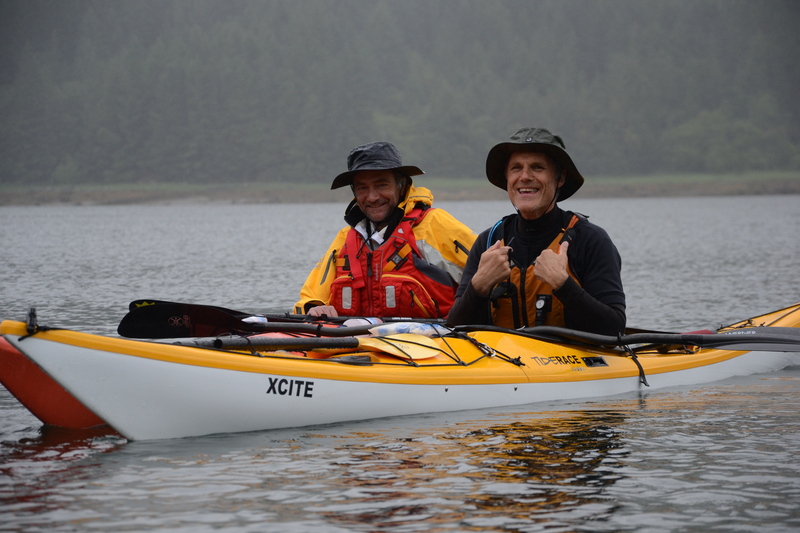 After breakfast and haring round Chris’s Ranch in the usual pre-paddle chaos, we had breakfast and set out in convoy to Loch Sunart for a lovely day’s paddling. Dan’s wire skeg had also malfunctioned due to a kink in the skeg wire which Geoff fixed before we headed out. 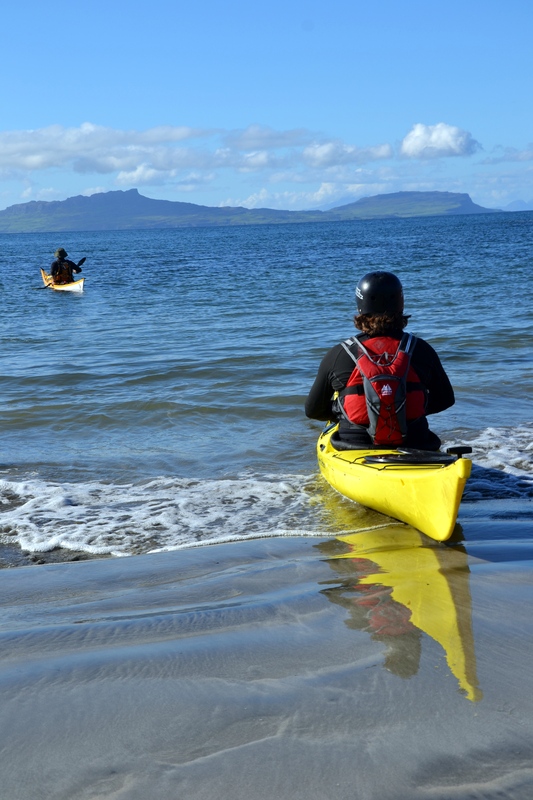 Paddling conditions were gentle and calm. We paddled under ethereal, bright, milk-white skies, the light diffusing gently through the thin veil of cloud overhead. 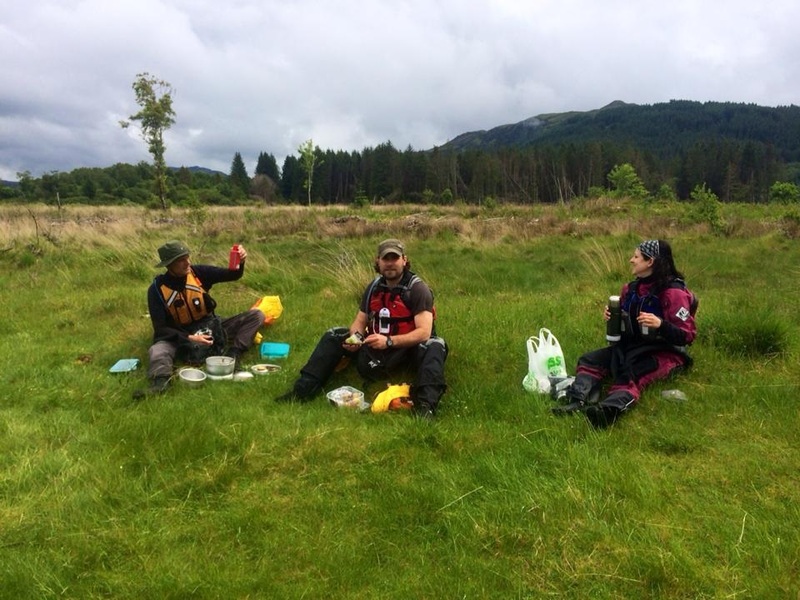 After heading down the beautiful Loch Teacuis, and stopped for lunch on Morven, where the CKC group had camped 2 years before. 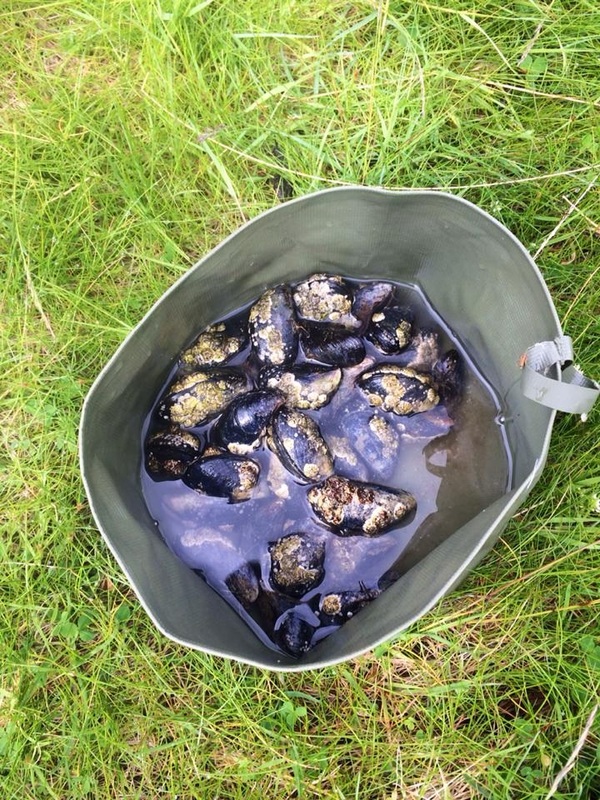 Alex cooked up some delicious freshly collected mussels for us all, and then we set off round Carna Island back towards Kilchoan. We made an early(ish) start and headed for Portuairk, where we set out to recce the conditions for a possible crossing to the Small Isles. After about half an hour, bouncing around in the clapotic waves along the shore, it became apparent that the weather was just too severe – the further out towards Muck we headed, the bigger the waves became. 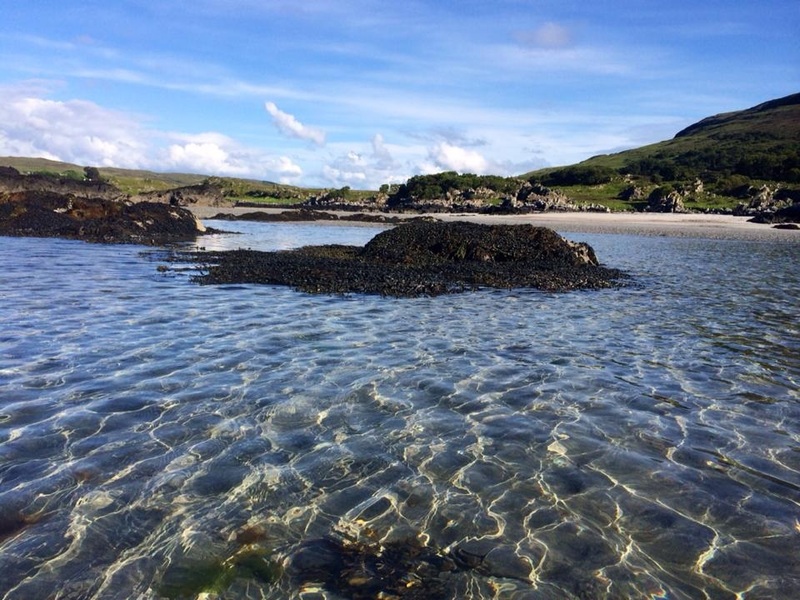 We turned back nearer shore and headed East along the North Coast of Ardnamurchan, waves still enjoyably bouncy, for a chilled afternoon paddle in the sun. We stopped at Glendrian, (in the same bay we’d stopped at on the way back from our crossing from Eigg, the previous year), for lunch, and just a little bit of disco dancing in the sun, before launching into the diagonal surf (expertly of course under Geoff’s expert tutelage) and carrying on towards Fascadale. After a short break for a cup of coffee, some dried fruit courtesy of Philippe, and a quick navigation check, we completed our journey to Port Ban for our first night of wild camping. Despite the low lying cloud that had been with us all day, we pitched our tents in the beautiful warm glow of the evening sunshine, to the (happily quite vague) interest of a few passing cows. After dinner, as the sun went down we were treated to a stunning light show as the low fluffy clouds were lit up in dazzling shades of pink, pale blue, orange, peach, turquoise and rose by the setting sun. I woke at 0723. For a moment I was at a music festival, crowds of people clomping past my tent. 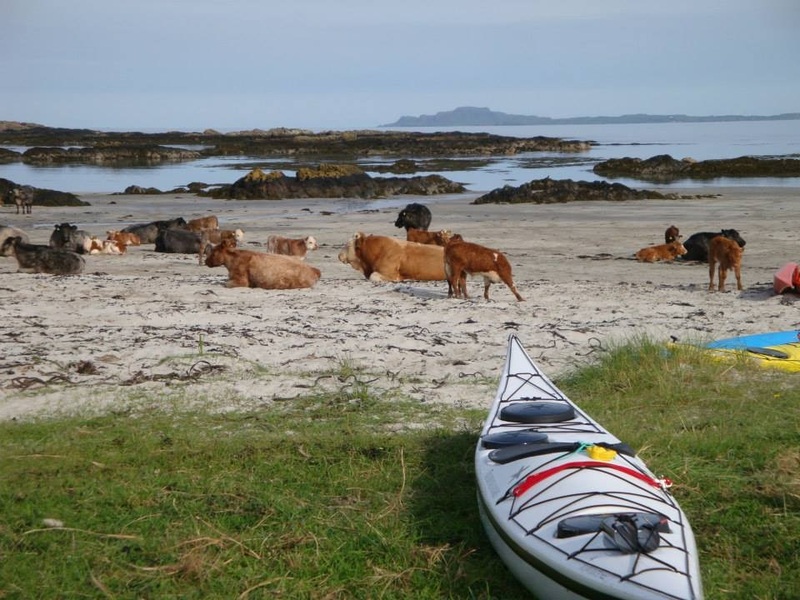 I re-oriented to my rugged Ardnamurchan home, and before venturing out of the tent, I remembered the passing thought I’d had as I drifted off to sleep – I bet the cows head down to the beach first thing in the morning for a salty breakfast, and we have pitched our tents right in their paths. I poked my head out. They did, and we had. We all stumbled sleepily out of our tents to see what was going on and saw an extremely hefty bull standing down on the beach between our kayaks and the water’s edge. “Daddy” remained stubbornly in his seaside spot for ages. Finally the farmer came down and gave him a friendly slap and a nudge. He trundled after the rest of the herd to his breakfast on the hill in the next field. We set off from Port Ban, the sea like a millpond. Geoff pointed out that after our early morning wakeup call, we were in good time for another attempt on the crossing to Muck, with plenty of time to return in the afternoon if needed. Everyone was keen. We listened to the Stornaway Coastguard’s 1010 weather forecast, which was excellent, and plumped for the crossing. 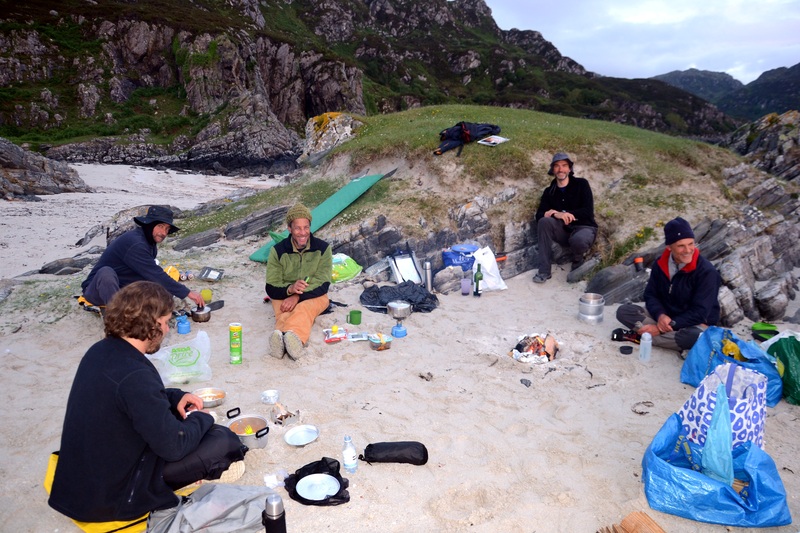 Despite the forecast deterioration in the weather “later”, we hoped it would hold long enough for us to camp for the night on Muck and return to Sanna in the morning. We set off again at 1030, and when we reached Fascadale, we took a bearing of 320o towards Port Mor on Muck. 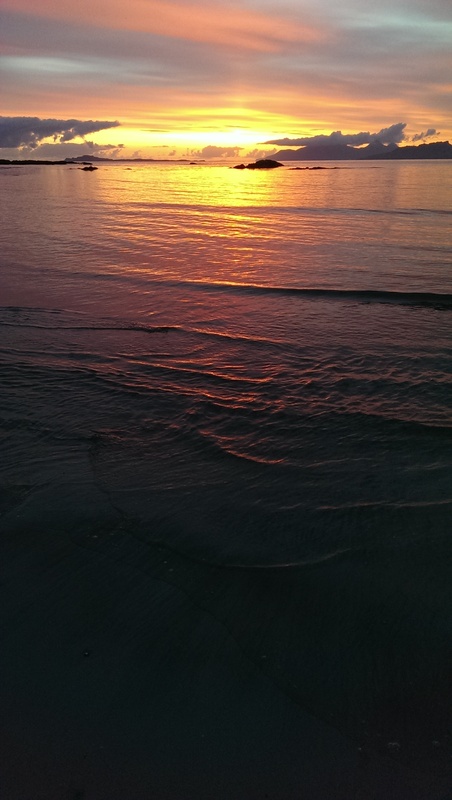 Conditions were perfect, with a broad gentle swell and a light Southerly wind. We stopped for a water break every 40 minutes or so, and completed the 11km crossing in just over two and a half hours. 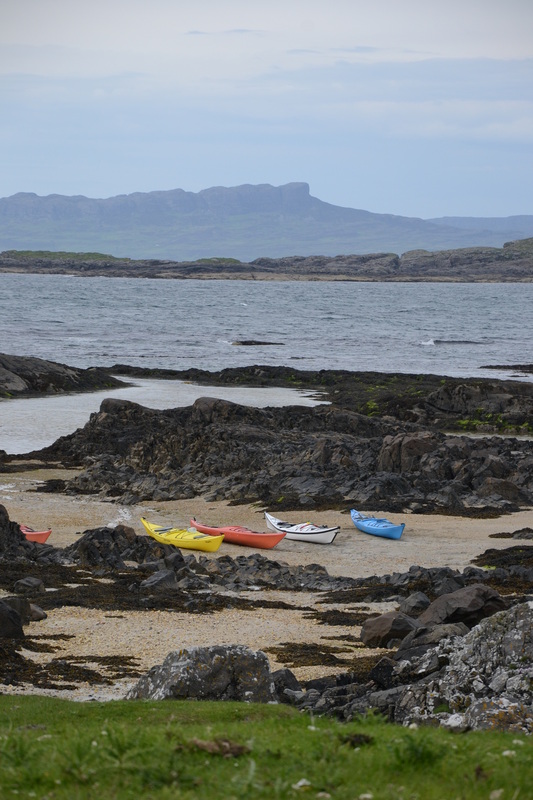 We arrived on Muck just after high tide, rafting up at the harbour entrance for the 1310 weather forecast on the VHF. After paddling the last half a Km into the harbour, we pulled our boats up onto the rocky shore, and meandered up the road to the tea shop, past two small lambs with matte black coats like coal. We ate our lunch lounging in the brilliant Muck sunshine – Cullen Skink with chunks of homemade brown bread, toasties with home-roast ham, pots and pots of tea, and delicious fruit cake and carrot cake. 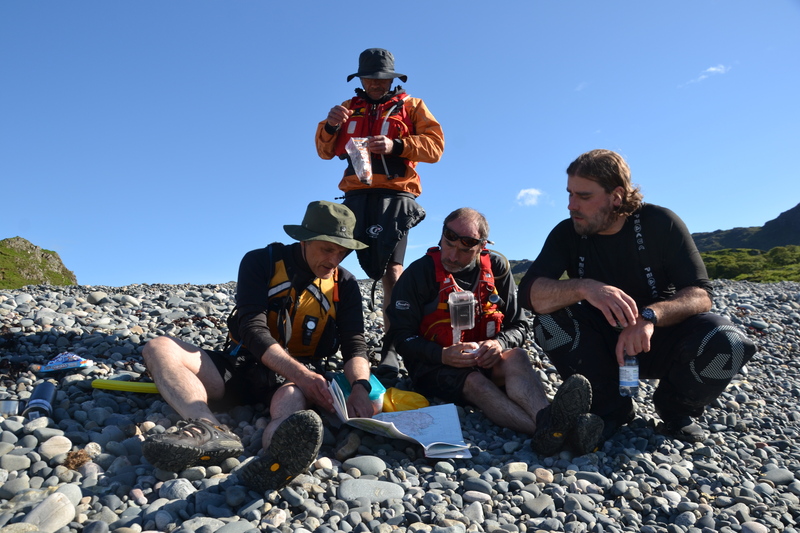 No holds were barred with the carb consumption as we now had another 3 hour crossing ahead of us – the weather forecast had banished hopes for a night’s stopover on Muck, as the wind looked to be up again within a few hours. We set off again at 1530 and headed out into the bay. The wind picked up. It made for interesting swell on our return journey to Portuairk. Initially conditions were helpful enough, windy but with a following sea. As we paddled on, the swell grew taller, and more clapotic. After about half an hour of bouncing around, I noticed that the rest of the group was disappearing regularly into the troughs of the waves, (putting the Sea State at 4, or “Moderate”) which were coming at us from behind and to the side. Despite the stability from the fully loaded boats, we were all being thrown around quite a bit in the swell, and paddling now required concentration and frequent brace strokes. 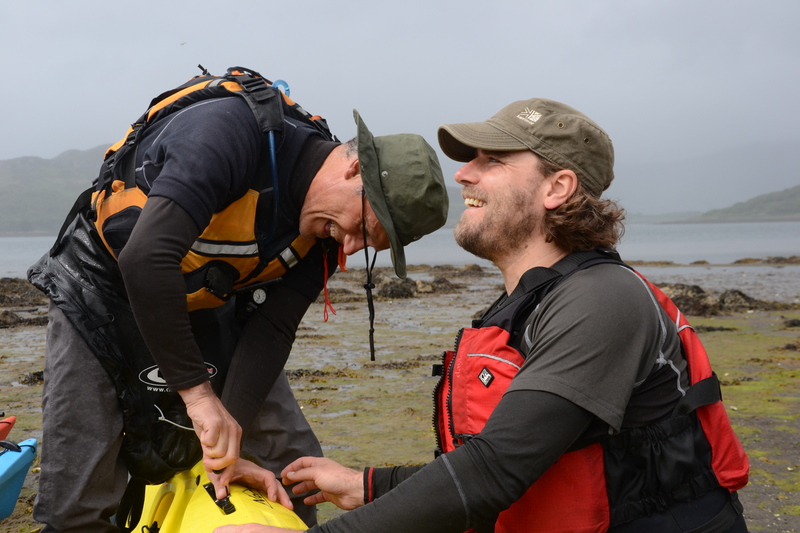 A trailing low brace came in handy on the most clapotic waves, but for the most part we stayed stable by keeping momentum up and powering forward, placing blades firmly into the front of the waves as they came at us from the side. 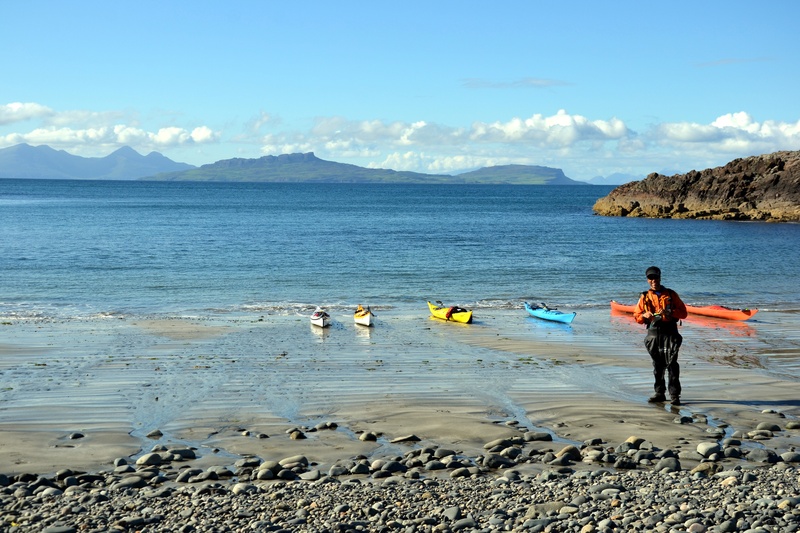 We arrived in Sanna Bay at 1800, exhilarated from the trying conditions, all of us on a high, after three hours of paddling absolutely in the moment without a thought for anything extraneous. 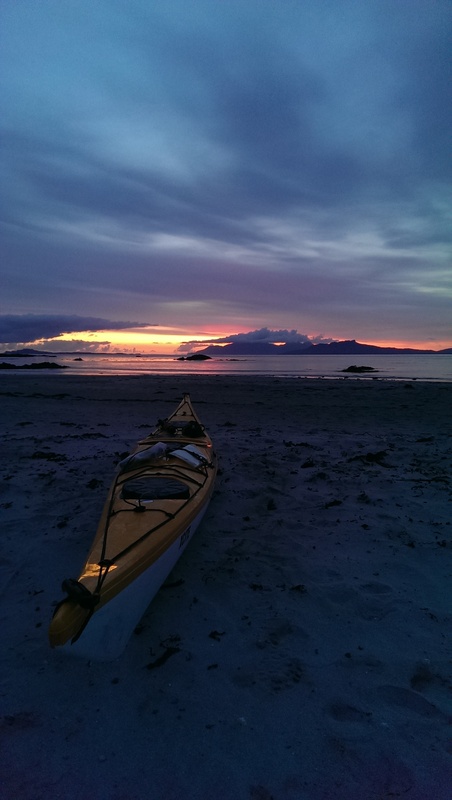 A wee dram was in order, and we toasted Geoff as a thanks for a great day’s kayaking. The tide was well on its way in as we lugged boats up the beach and loaded cars. 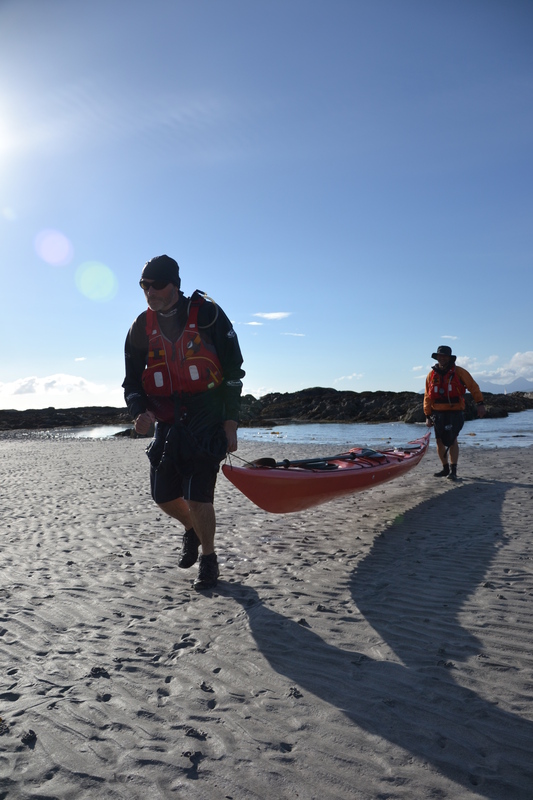 As we had paddled up the cove on our way in, we’d noticed a sheep stranded on a low rock and despite the day’s efforts, Alex still had enough oomph to rescue it and send it scampering on its way. Restored by Kenneth’s hearty dinner of bean and vegetable stew and toasted bagels on Wednesday night, followed by cheeses, oatcakes and a couple of glasses of wine, we were more than ready for another day’s kayaking on Thursday morning. Eventually. We made it out of the ranch at about 2pm, headed for Loch Moidart, loaded up with firewood and some good food for that night’s campfire meal. 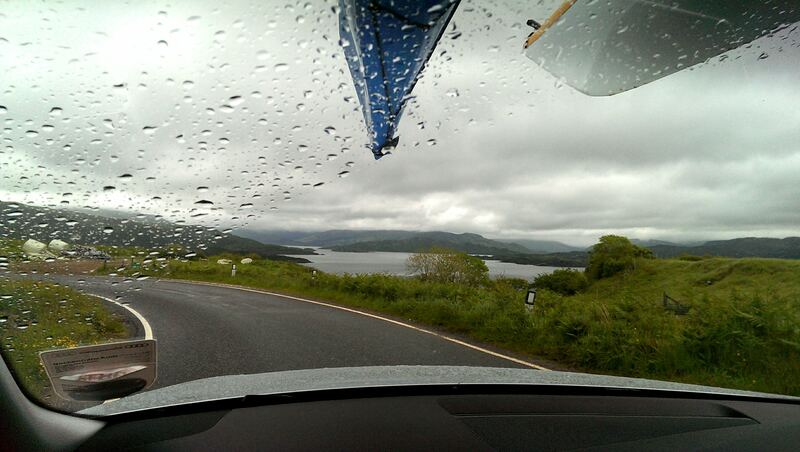 The drive to Loch Moidart was stunning, through breathtaking scenery, and on the way we stopped at the shop in Salen. We bought Nutella and fresh rolls for the next day, stocked up on Whisky and had a little sit-down for coffee and cake (as it was still only 3pm…) Then we made our way to the get-in and loaded the food and whisky into the boats, along with plenty(!) of firewood. 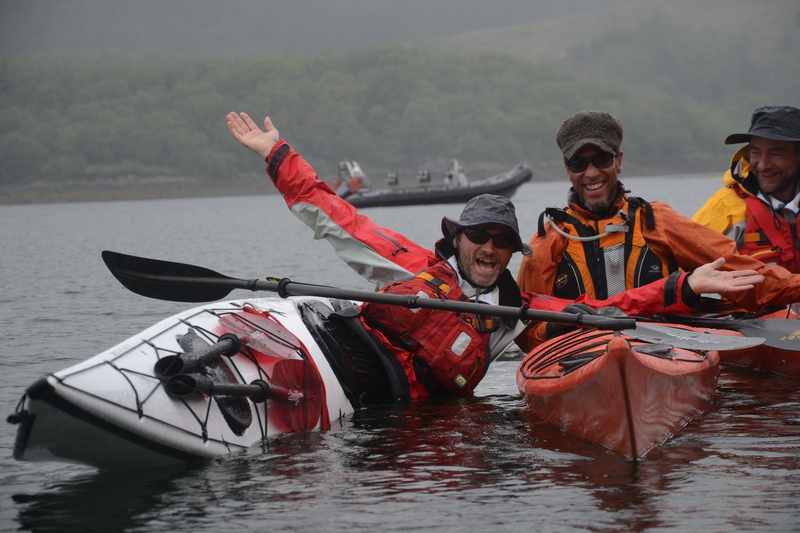 After our chilled, meandering day, we set off at 1700 for our paddle through the Loch. No-one was in a hurry, and it was low tide as we made our way past the Casteal Tioram ruins, down the South Channel and out past Eilean Shona to the open sea. We pootled up the coast to our second wild campsite, going quietly as we passed a group of seals resting on the rocks, and arrived in time to set up camp before sunset. Alex donned his rubber suit and headed back in the water to perfect his already not-too shabby offside roll. I pitched my tent, on a hillock above the beach, as a sea-otter fished for its supper in the bay beyond. There was a lowered sandy plateau on the beach below our campsite, with a lovely echo – perfect for Dan and Kenneth to have a little percussion jam session with the firewood. Then Geoff lit a perfect cooking fire for our evening meal, (the usual paddle nosh but also baked sweet potatoes, carrots and shallots warmed in foil in the fire). 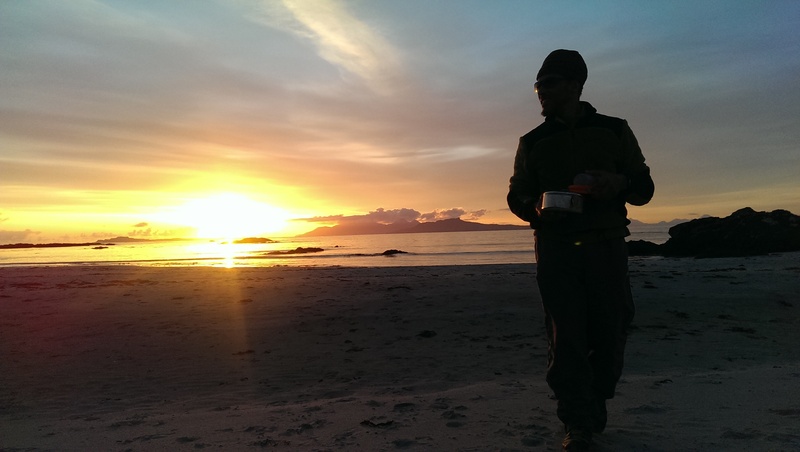 We ate on the sand, enjoying just being, under the sky and by the sea, as the sun set over the Sound of Arisaig. Day 7 dawned sunny and lovely. 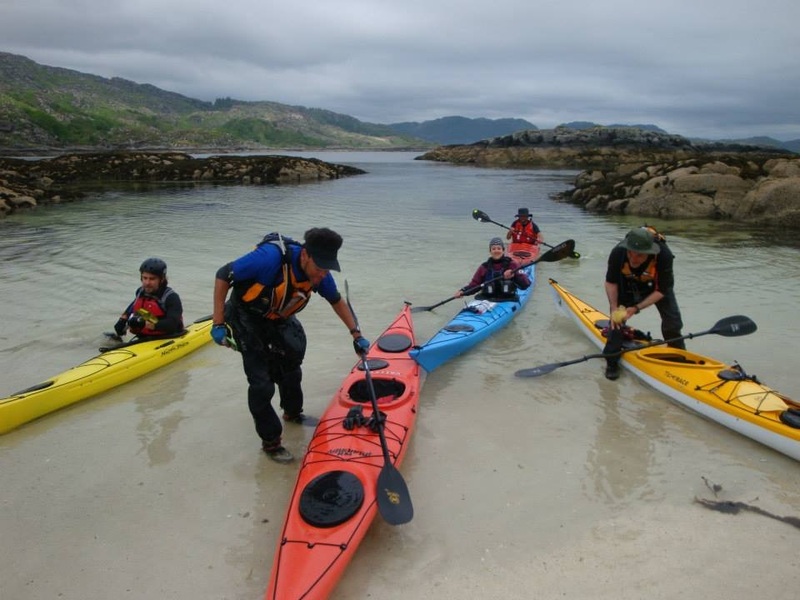 We left our beautiful campsite, and paddled our way through turquoise waters, in the blazing sunshine back to Loch Moidart. We made our way through the North Channel, stopping to explore on the way. We beached at Casteal Tioran, our lunch stop and climbed up to the Castle ruins for a wander. Passing walkers and kayakers were friendly and had come from all around. 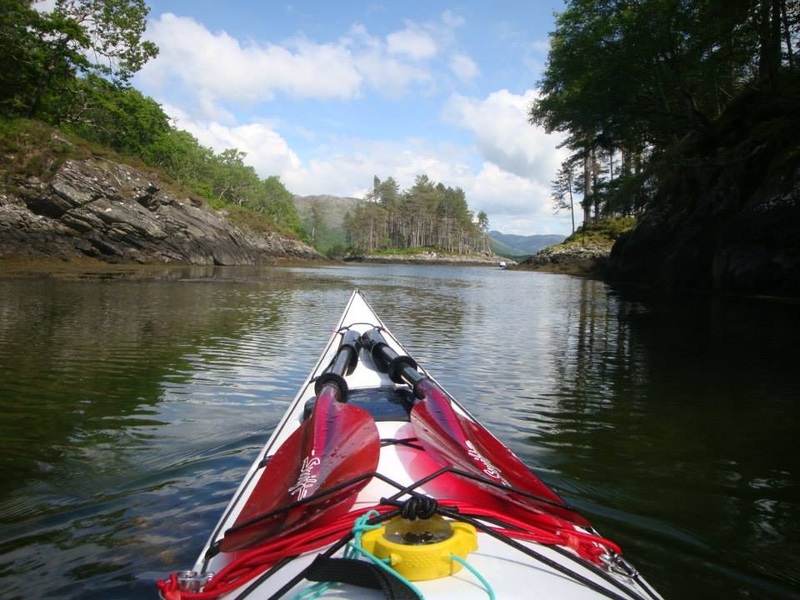 We chatted to an older couple from Cheshire, out walking their gorgeous collie, (who wasn’t allowed any leftover salami due to his special diet) and two other sets of sea-kayakers enjoying a beautiful sunny day paddling round the peaceful waters of Lock Moidart. We had a pretty epic lunch, finishing off all the left over provisions, topped off with coffee and delicious maple waffles drenched in Nutella (thanks Kenneth!) We meandered back to the get-in, stopping before we got out for some skills practice (who could resist in the beautiful warm sun), Geoff demonstrating a beautifully poised balance brace, Kenneth slickly executing a roll, and Alex practicing leaning backwards into a low scull. 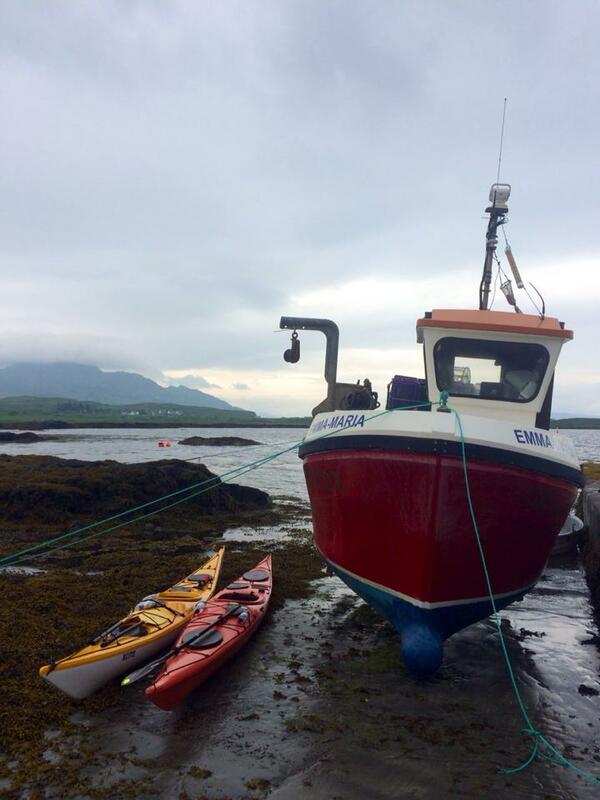 I went for a long, cool swim in the Loch – my first wild swim of the season – and then we unpacked the boats, loaded them on the cars and headed back to Kilchoan. We just about managed to unload and rinse the kit in time to get in the RIB and head back across to Mull – spotting a porpoise on the way out, heading toward Tobermory lighthouse. We celebrated our last night in style at MacGochan’s – there was a good old Scottish jam session in full swing when we arrived. Two accordions, bagpipes and a frenzied percussionist playing sticks on the table top belted out reels, jigs and a traditional medley of Marie’s Wedding and Scotland the Brave. Brilliant. Then a round of double scallops and dark ale before heading back to Kilchoan across the dark and quiet Sound of Mull. Brilliant trip report Miranda. Thanks for doing this.